The final result is being announced just now. This is the top 5 winners. Congratulations! Your results can be seen at "MyPanda". Popular event 42.195 Marathon Championship was well received so we organize it again this year.You have 42 days and 19.5 hours to play your games, as many as possible (with a minimum percentage). This year is the 10th anniversary of the 42.195 marathon championship and, as a special event, the Triathlon Championship will be held this year! Enjoy the two new categories as well as the normal Marathon games! Cho Chikun (25th Honinbo), the referee of the event always tries to spread the game of Go. 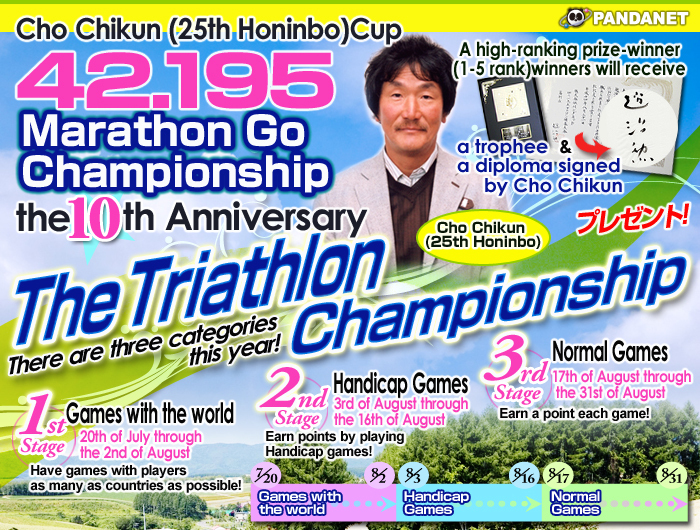 In Marathon Go event, you compete for the number of games played in the designated period. However the following games will not be counted. Earn as many points as you can! Five points are added each time you play with a player from a new country within the above schedule. Points are not added when you play with a player from the same country. Two points are added each time you play a Handicap game within the above schedule. One point is added each time you play a game with or without handicap stones. The maximum playing-time per day is 5 hours and any game starting after this time limit will not be counted (In case of a game played over two days in Japan Time, it shall be counted in the date it has started). A game which was interrupted due to disconnection by both players. The Organizing Committee reserves the right to disqualify any player who is excessively discourteous to other players.